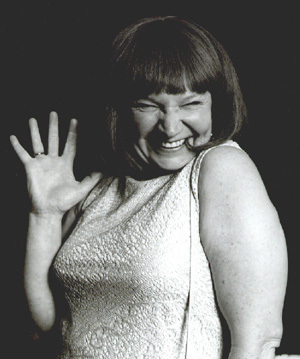 Mrs Barbara Nice is the comedy creation of Janice Connolly. Barbara is your average Stockport housewife who given up the domestic bliss of Tupperware and Poundstretcher shops for the unpredictabilty of the comedy world. No audience is too rowdy for her to handle - she's already raised five teenagers. With the affectionate attitude of a playgoup leader at a wild Iggy Pop concert, Barbara is guaranteed to warm the heart of any audience.
" she doesnt just blur the gap between audience and performer-she obliterates it" Edinburgh Evening News.
" Imagine a hybrid between Mrs. Merton and Victoria Wood" The Times.
" A cross between Victoria Wood and Janis Joplin" The Stage.
" Shes on the road to comic stardom " The Times. Birmingham. Leiceter, Brighton, Edinburgh, Liverpool, Southport,Manchester. Stephen Bill`s "The Locksmith " BBC2 as Yvonne. Janice has created very many plays which have been performed professionally for "Women and Theatre" The award winning Birmingham based community theatre company. The company uses the voices of real people and tells their stories. She has also written "On The Slate" for Pentabus Theatre company "An everyday tale of home freezing and homicide"
award to create a female version of Jekyll and Hyde-"JAckie and Heidi " again for Women and Theatre. Janice is a very experienced actress and has worked at The Birmingham Rep as well as performing extensively throughout The Midlands community theatre circuit. Snow White with Lily Savage at THe Manchester Opera House- 2002-3 -as Nurse Nice. Panto in Bristol with Lily Savage - 2003-4. Community based work includes working with women on probation and excluded young people.